Looking at installing the fencing yourself? Mark out the position where you require the fencing to go. Measure the distance using a tape measure. Stepping out the distance invariably results in shorter measurements, which will result in insufficient fencing being obtained. It is of utmost importance to begin with the positioning of the gate FIRST. Then you may proceed with the layout and positioning of the fencing. Fencing is normally sold in 2metre sections and posts fitted with double collars. This is suitable for flat land only. The leading posts will need to be fitted with 4 x single collars each. It is important that the overall length of sloping land or banked terraces is accurately measured. Gates must be installed where the land is flat. 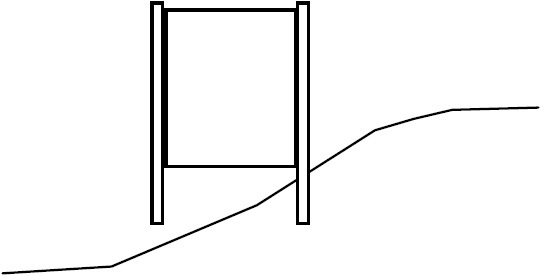 Gates cannot be installed running down a slope or bank as (1) the posts are too short and (2) a large gap will be left under the one side of the gate panel. Posts should be installed in a slightly dry mix of 1 part cement and 4 parts Umgeni Grit and dampen with water. Dig the posthole to a full spade depth (+/- 250mm). Half fill with the cement mix and stamp until firm. Place the post into the hole and hammer it through the mix until the correct post height is reached, which should be 1.2m from the ground. DO NOT HIT DIRECTLY ON TOP OF THE POST WITH A HAMMER.This will damage the top of the post and the post cap will not fit. Place a thick piece of wood on top of the post to protect it and then hammer on it to install the post. Attach the panel to the post. Identify the position for the next post and follow the same process. Horizontal and vertical levels of each post and panel should be checked and adjusted before installing the next panel. Follow the same procedure as for installing posts except the hole must be dug to the full depth of the spade (300-400mm). Half fill with the cement mix and stamp until firm. When hammering in the post ensure that the cross bar at the bottom of each post is fully encased with cement mix and has not gone through to the underside into the soil. If this is not done the post will twist with the repeated closing of the gate. The gateposts must be 90° vertical with the ground to ensure that the gate locking mechanism engages correctly. The Gate panel edges must be vertical and in the centre of the gatepost. Additional Detailed Gate Installation instructions are available. 1 x Hammer – 4lb hammer is suggested. A thick piece of plank – to use on the top of the post when hammering in the post. 1 x 3mm Allen key or small flat screwdriver – to adjust the collar grub screw on the posts. 1 x 5mm Allen key or screwdriver – to adjust the bullet grub screw. 1 x A paint brush – to do the touch up of scratches after installation. Where the fencing is to be installed on paving, bricks or slabs various options are available and may require additional equipment. It is important to provide details if paving is involved. In these cases the posts are manufactured with a 12mm spike and plate. A 12mm hole must be drilled into the paving. The post is inserted into the hole and then secured with 2 or 4 x 10mm coach screws fastened through the base plate. In the case of Gates, 4 securing screws are required. Alternatively, for 32mm standard post, a 50mm hole must be drilled through the paving using a coring drill. The post is installed in the hole and secured with cement. A Standard pool fencing panels. Manufactured from 8mm vertical bars spaced 100mm apart, with 10mm horizontal stiffening bars. Finish is either unpainted or painted. Gate Posts are 1.5m high made of 38mm mild steel tubing. Intermediate Posts are 1,5m high made of 32mm mild steel tubing. Panel to post connection by means of an easily adjustable sturdy nylon collar. Double Collars are used for In-line erection and single collars to for corners and uneven ground. The installed height is 1.2m or 900mm high. Simple to erect. No on-site welding or drilling of steel. Post collar and gate bullet adjustment by means of Allen key. Set hinge post ‘C’ plumb into level ground ensuring the top hinge ‘G’ Is 90° to fence ‘A’. Hang gate panel on post hinges ‘G’ and ‘J’. Set of the last vertical bar on the gate panel with the centre line of locking post ‘B’. Ensure locking latch D’ lines up with top horizontal bar of the gate panel. Slacken off grub screw on “bullet” ‘E’. Set the “Bullet” into the aperture and tighten screw. Check gate is self closing and double latching. Concrete posts to avoid any movement (N.B. this is important). 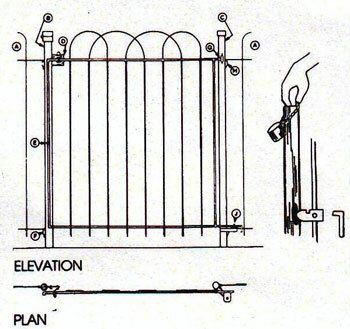 Continue fitting panels ‘A’ to one or both sides of gate using lugs ‘F’ and ‘H’. The Impetus of the gate closing will cause the locking “Bullet” to enter the gatepost through the aperture, forcing up the locking cylinder. This cylinder will automatically position Itself In the slot on the top of the “Bullet”, so securing your gate. Remove the cap covering the top of the locking post, raise the mechanism by lifting the lever with your finger and simultaneously open the latch with the other hand pushing/pulling the gate away from the post. The gate will then release. The lower hinge is offset from the post. When the gate is opened the gate panel is lifted at a slight angle. On releasing the gate panel the centrifugal force results in the gate swinging closed again. A “bullet” attached to the gate panel engages into the latching post and locks the gate panel in place. The locking device is mechanically operated by lifting the mechanism inside the latching post, holding it up and unlatching the panel using the other hand. The gate panel can now be opened. Releasing the locking mechanism resets the gate to lock as soon as the panel is released. Two hands are required to open the gate at all times making the co-ordination difficult for a child to master. Opening the gate towards one self and having to step backwards, also adds to the safety aspect as a child will naturally push to open the gate. The latch is also lockable by means of a padlock. ie: we have a self-closing, self- locking, self-latching and padlock lockable gate. Remove the cap off the top of the Locking Post. Raise the mechanism inside the post by lifting the hook with your finger; at the same time unlatch the gate. The gate-locking device will be released and the gate will open.